Hassalâ€™s corpuscules are seldom seen in the avian thymus (see also previous picture). More frequently, reticular structures are formed. These reticular structures are extended, diffuse forms of Hassalâ€™s corpuscles. They consist of irregular groups of vacuolated reticular cells, degenerating cells and smaller and larger vesicles. 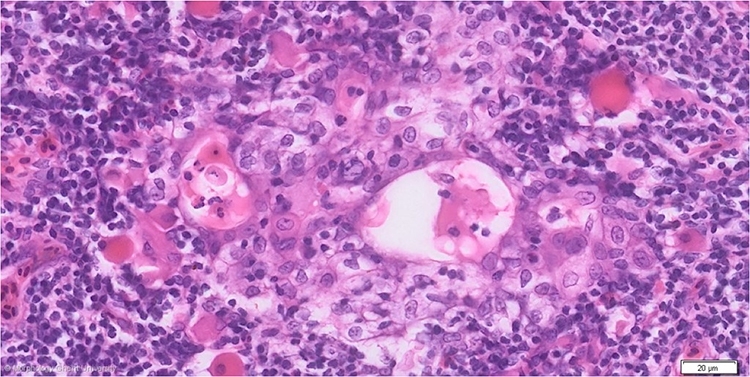 In the centrally lying large vesicle on the micrograph above, degenerating lymphocytes can be seen. The smaller vesicles are filled with an eosinophilic substance. The reticular cells are enlarged and stain palely due to the presence of intracytoplasmatic vacuoles.